"Being sent out at age five with a limited amount of jerky and water. First time a full day at age five. One day and one night at age six. Three days and two nights at age seven. Four days and three nights at age eight. Five days and four nights at age nine. At age ten, I went to accomplish my first edible "kill". You had to find your own water source. My generation was the last to go through this ritual. The clan marked the cheeks of the child to prevent anyone in the tribe from helping the trainee during the ordeal." "I have been assimilated into the white man's culture. It is difficult to follow the old Indian ways. Travel and transportation of any kind is no longer by horse and wagon. Barter was a way of life. We lived off the land. Courtships, marriage, childbirth were community efforts. Building homes, growing crops and rituals were events in the lives of my parents and grandparents." "I try to speak my language (Kickapoo) as much as I can. I was discouraged in trying to speak the language of my tribe when I was a youngster. I try to teach the new generation their tribal language. Keeping respect for the things in nature around me. Not to destroy animals for "sport". Only to take what is necessary to survive." "I felt honored to be able to represent my tribe. 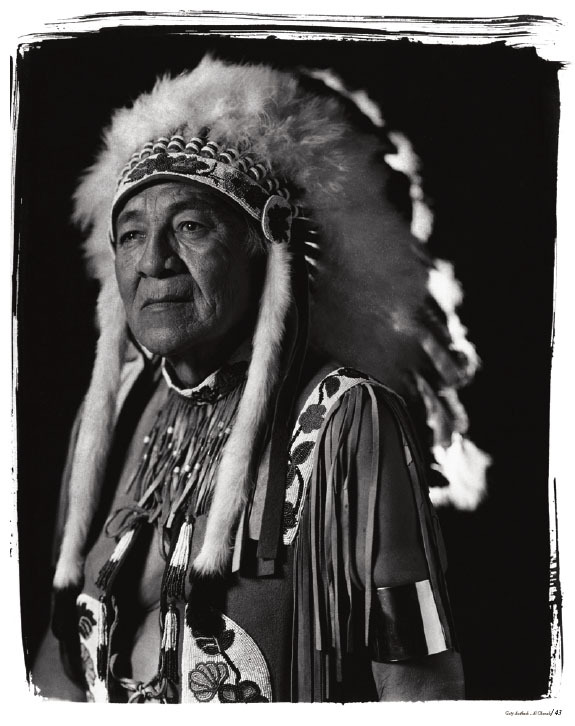 At 82 years of age, I am one of the oldest members of my tribe." "I am afraid man is polluting his own nest. There is no future unless he learns to respect the land, animals and his fellow men!"